Gee I feel like I am watching my own build again... deja vu right there. Looks like my frame pics have really helped you. Good to see. One thing I would probably do a little different if I did it again is make the rear cross brace go up and over the exhaust. Easier removal of the exhaust and also means the car can be lowered another inch or so and still achieve the required 100mm clearance. If you have mounted the front tie rods in the original position then they will foul on the engine and the subframe. Some people have modified the sump to get the clearance from the engine but it will still hit the subframe arm unless the arm is lower. My tie rods have been mounted out further than original to clear the engine and assist with the sag clearance. I then had to shorten my tie rods to fit accordingly and also made larger bump stops for the top arm to reduce the sag when the car goes over a bump or is in the air. Did you need a spring compressor to compress the donuts so you could get the hubs in? Or did you lower the bottom “arms” of the subframe ? I cut them and tapped them so they remained adjustable. If they are the original length then you may struggle to get the caster settings right. We try to aim for positive caster. Mine is about 3 degrees. The longer tie rods would give you negative caster which is not ideal for handling. I put the springs and top arm in first then put in the larger bump stop to fit the hub, lower arm and tie rod. There's a bit of a sequence to it. Yes my lower arms are made of 4 pieces to keep it more out of site from the front view. 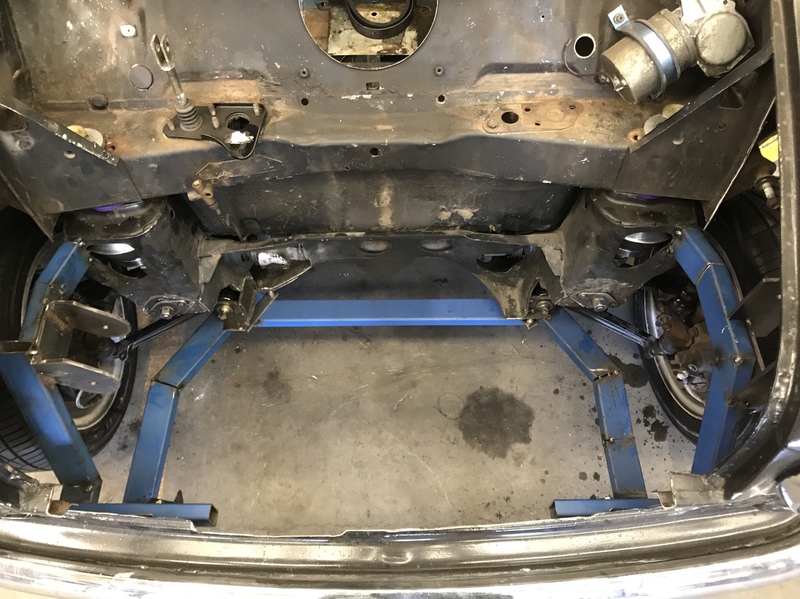 I think the best way to fix you lower suspension setup from where it is would be to get the car in the air with the engine on it and lower bumpstops fittedto the upper arms, remove the lower frame rails and build new ones in there with the lower suspension arms in place. 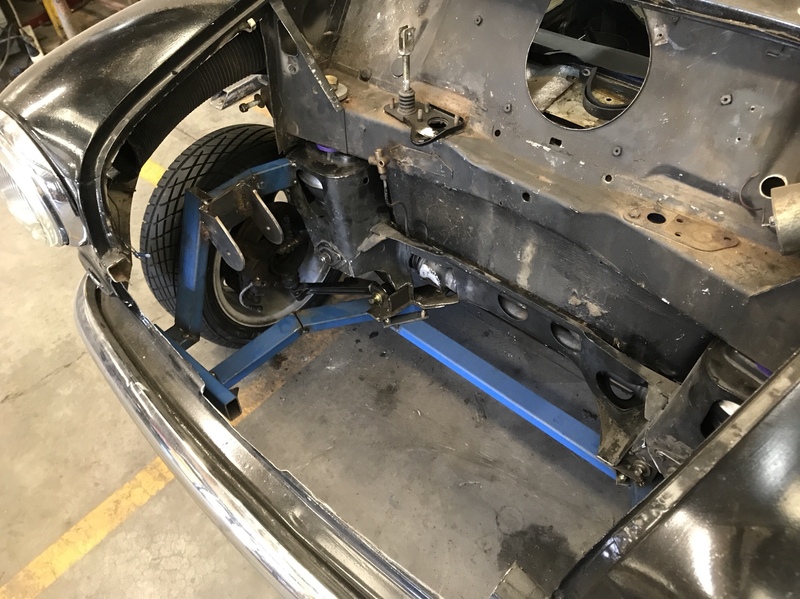 The distance between the balljoint mounts sould be setup to be about a half inch longer than the end to end measurements of the balljoints on the hub. Some allthreat should so the job nicely here. 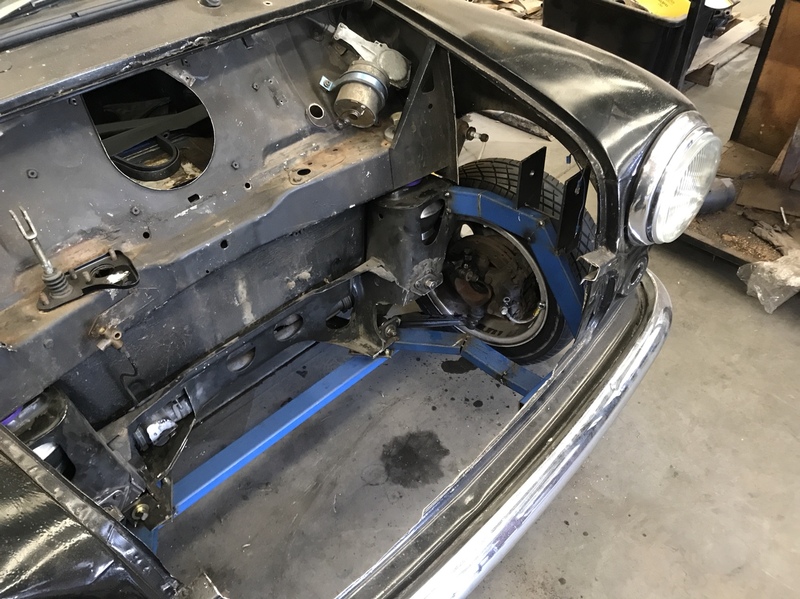 Once thats all setup you should adjust the front tie bar mount if neccessary first - you want it to be in as far to the original location as possible, but still with a good half inch clearance between tie bar and sump. Once that's in, you can fabricate your new lower arms to go around and under everything with suitable clearance. Off topic but what is the car behind yours...with bonnet up? Its been a few months- have you got that frame sorted out yet? 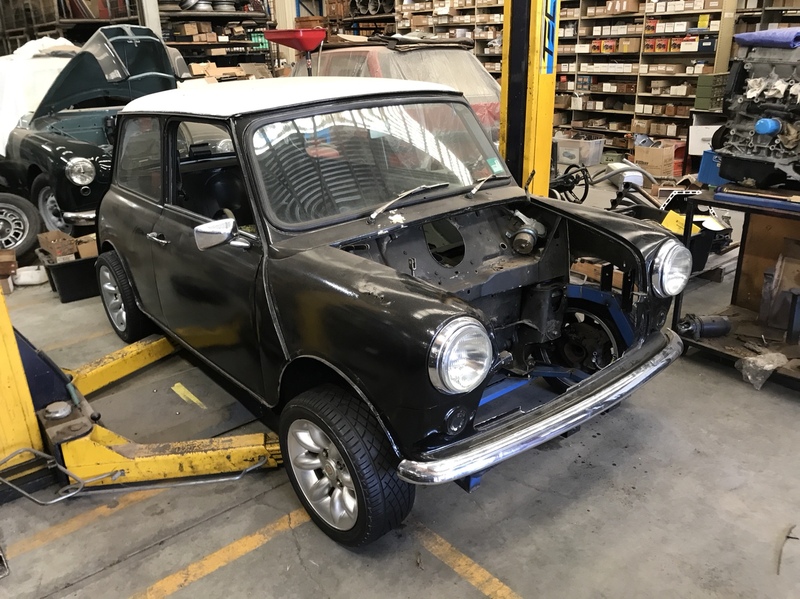 I have decided to purchase an allspeed frame as my motivation in completing the current frame has disappeared, however, I may look at modifying it based on measurements from the allspeed frame. If you're that worried about finishing your frame then best to just order the allspeed one then. At least it'll be here by August so you can get the engine in your cat really quick. Make sure you think through the flip front though. Thats heaps harder than doing the subframe. If you dont have the time to make your own frame then doing a front end might not be a time saver you would otherwise think it is. That said, they are a handy feature worth the effort. not much of an update since i havnt actually done any work.. and cant take any pics.. There you go, something to cut and weld in the meantime till the frame turns up. Once that frame arrives it'll all pick up then. Did you end up getting that Allspeed frame?